Welcome to our Spring Newsletter. We hope this finds you all well. Please read below about the important events that are happening over the coming months and have a read of our Annual Report for 2017. 21st March, 6th June and 3rd of October 2018 at 11am. The Venue is to be advised. The Volunteer Managers Forum is an opportunity to meet with other volunteer managers, paid and unpaid, to get support and discuss topics affecting those who manage volunteers. The DPC has launched a GDPR-specific website www.GDPRandYou.ie with guidance to help individuals and organisations become more aware of their enhanced rights and responsibilities under the General Data Protection Regulation. The DPC has also prepared an introductory document for organisations to help them as they transition to GDPR: “The GDPR and You”. This document lists 12 steps which organisations should take in order to be GDPR ready by 25 May 2018. It should be noted that the guide is not an exhaustive list and organisations should ensure that their preparations take account of all actions required to bring them into compliance with the new law. For guidance on whether your organisation needs to appoint a Data Protection Officer, and how to ensure that your DPO is adequately resourced for the role, see the DPC’s Guidance on appropriate Qualifications for Data Protection Officers (GDPR). Information about the DPC’s awareness raising activities and outreach engagements over the coming months can be found at GDPR Awareness Raising Activities. On the 28th Jan 2018, many volunteers came to say Farewell to Kelley Hynes who had been with the ISPCA for thirteen years as Animal Care Assistant and more recently Volunteer Co-ordinator with the ISPCA. We wish the new Volunteer Co-ordinator, Emily every success for the future in managing the Volunteer Program with the ISPCA. The ISPCA have over sixty volunteers involved in the care of animals and without the Volunteers they would not be able to successfully rescue and rehome so many animals. 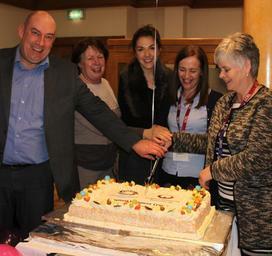 Longford Volunteer Centre celebrated its tenth year in operation at International Volunteer Day (IVD) December 5th. IVD is an observance day designated by the United Nations since 1985 and offers an opportunity for volunteers and organisations to celebrate the efforts that they make to Irish society day in and day out. Annually, Longford Volunteer Centre marks this day with a volunteer recognition event – our way of saying thanks to all the volunteers who give the greatest of all resources – time – to help out at different events in Longford. Thank you all for your continued support and co-operation during 2017, and we look forward to working with you in 2018! Please click here to read our Annual Report for 2017. If you require any help or assistance with Volunteer Management or Recruitment, please do not hesitate to contact me.